The sound of a baby crying is the most natural and instinctive sound that a human can make, and yet it is still so misunderstood. There are two major camps when it comes to responding to a baby’s cry: the first is to respond immediately to help ease the baby of whatever is bothering him or her, and the second is to allow the baby to ‘cry it out’ so that he or she can learn to deal with problems on their own. The following are some basics about a baby’s cry, and why you, as the mother, should listen. Crying is a perfect signal, and is the only way that your baby can communicate with you. 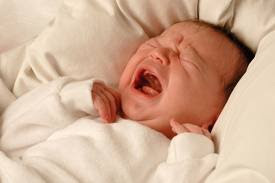 Newborns cry by reflex when they sense a need or discomfort, and the signal itself is appropriately disturbing: loud enough to get your attention, but not so awful a sound to make you want to avoid it altogether. You are biologically programmed to want to give a nurturing response to your crying baby. When your baby cries, you experience increased blood flow to your breasts and a strong urge to pick up your baby and nurse. Through nursing, a hormone called oxytocin is released and brings feelings of relaxation and pleasure, which eases the built-up tension from your baby crying. Basically, these feelings help you to love your baby. This is also why it’s easy for strangers to get upset when your baby cries, as they are not biologically connected. This is one of the most popular debates in parenting books and discussion forums all over the world. Ignoring your baby is essentially a lose-lose situation. A baby with a compliant personality will eventually conclude that crying is not worthwhile and that he or she is not worthwhile, thus breaking down the most basic lines of communication with you. A baby with a persistent personality will simply cry harder and louder with a more disturbing pitch. When you eventually pick up your baby, he or she will think it was the crying that got your attention which will either cause a disturbing cry every time, or will teach him or her that they have no power to communicate with you. Your other option is to give a prompt and nurturing response to your baby’s cries. This style is win-win as it helps you and your baby work out a communication system that helps you both. The more you respond, the less frantic and desperate the cries will be in the future, and a better bond can be forged. Babies cry because it’s their only means of communication – not because they like to. First, crying is not good for their lungs, and second, babies who are left to cry have been found to have elevated heart rates and lowered oxygen levels in their blood. When crying infants are soothed, their heart rates return to normal; but if they are left to cry it out, they remain in a physiological and psychological state of distress. Learning how to respond to your baby’s cry is one of the most difficult communication challenges you will face as a mother. If you decide to think of your baby’s cries as a signal to be responded to rather than a habit that should be broken, you will quickly become an expert in your baby’s signals. In the short term, this is better for the health of both you and your baby, and will lead to a better bond and communication down the line.